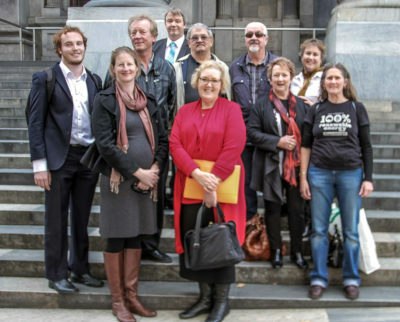 The Repower Port Augusta local community group was formed in May 2012 following a series of approaches and public presentations from a coalition comprising a number of environmental NGO’s and organisations including the Australian Youth Climate Coalition, Climate Emergency Action Network , the Conservation Council of SA, Beyond Zero Emissions, 100% Renewable Energy, Doctors for the Environment, and 350.org. Beyond Zero Emissions, (a think tank comprising mostly engineers and scientists) had developed a plan titled Repowering Port Augusta as a development from their broader-based Zero Carbon Australia Stationary Energy Plan. The fundamental basis of the Repowering Port Augusta report was the construction of concentrating solar thermal power stations with molten salt storage in the Port Augusta region. The local group was formed to spearhead a public campaign, supported by other alliance members, to take whatever actions it could to help make that happen. Our members all saw benefit in solar thermal with storage not only to Port Augusta, but also to the wider South Australia electricity supply network, and to the environment. Here is what some of our long-serving members had to say about why they became involved with the group. From a past built on coal to a future built on solar thermal. This is the story of how Port Augusta is leading the transition to clean, renewable energy. We won! Lisa Lumsden explains why this win is so important for the people of Port Augusta, South Australia and the whole country. 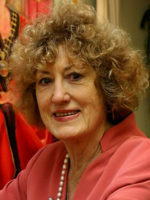 “I am a founding member of the Repower Port Augusta. I joined because the future energy system needed to be changed. 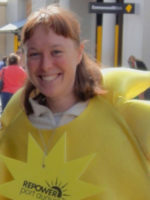 “I got involved with solar thermal power because I could see the physical damage to the community I cared for, whilst working as a nurse in Port Augusta. Solar thermal could provide energy without detrimental effects to the people who lived nearby and the environment and best of all was a proven technology. Repower Port Augusta provided me with an avenue to lobby for this to happen and it has been a long road. My husband and I lived in Leigh Creek and knew the devastating fracture in the community once the mine closed. He lost his job and so did I.
I am proud to be part of the committee who has stuck at this through the years and provided help when the call went out. “I joined RPA in late 2014 after returning from volunteering in East Timor. I had been following the RPA’s activities via their email list as I have always believed renewable energy the best option for a sustainable future for our planet. As an environmental scientist working in the areas of sustainable land use and sustainable development, mining a resource to create heat to make steam, never made economic or resource management sense to me. The sun – that great big nuclear reactor that is the centre of our galaxy – is the source of all the energy we need. And solar PV, wind turbines, pumped storage and Concentrating Solar Thermal are all proven and improving technologies that successfully harness that energy. I also love living in Port Augusta and strongly believe we have the potential to be the centre of renewable energy for South Australia and perhaps southeast Australia. We have the solar resource, the power generation history, and the skilled people to make this happen. Now that many solar energy projects are being established around Port Augusta I am proud of the small part I played in making this happen, and I believe this new industry for our city will be a sustainable industry in which our community can also be proud. Sadly, a number of our members tragically passed away during our long campaign. Our former mayor, Joy Baluch AM, took a very early and keen interest in the solar thermal technology and was instrumental in fostering the initial public meetings and formation of our local group in May 2012, even as her health deteriorated badly. The addresses given by Joy at the start of the “Walk for Solar” in Gladstone Square and before a huge crowd on the steps of Parliament House in September 2012 were powerful messages of advocacy for Port Augusta as a home to concentrating solar thermal with storage. Sadly, Joy passed away in May 2013. Repower Port Augusta lost another solid worker and campaigner for solar thermal in Frank Horvat in late 2013, an unassuming dedicated man who just stood up to counted in advocating for the adoption of this technology in Port Augusta. Frank was a valued contributor to our campaign. 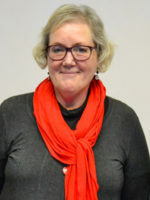 In September 2016 we were greatly saddened by the death of Glenys Behenna, one of the founding members of Repower Port Augusta, and a fantastic contributor to the campaign, always ready to pitch in and do the hard yards of manning stalls, and gathering support for our various type of petitions, and speaking at events. Sadly, Glenys didn’t make it to enjoy the success of the campaign, but Glenys’ contribution will never be forgotten. There were other Port Augusta residents that were members of our group for a time and contributed what they could, and those contributions are valued. Amongst these community-minded people were our Mayor Sam Johnson, Leonie Bakk, Jesse Size, Jenny and Ben Ellis, Cat Peters, and no doubt others I have left out, apologies for that. We also thank the many people from the general Port Augusta and regional community that were happy to support our repeated initiatives to demonstrate a public appetite for this project. The support received from outside of Port Augusta for this project was absolutely tremendous. In particular, the efforts of Daniel Spencer must be acknowledged. In 2012, Daniel, originally from the Australian Youth Climate Coalition, came to live in Port Augusta at the age of 21 to foster the early months of the group’s operation and went on to be the key strategist and media/political liaison for the campaign. A truly outstanding and inspirational person. Many other NGO groups, unions, and individuals around Australia etc., were also very strong supporters, again very much appreciated. We thank politicians that spoke out or more importantly took action, to positively support this project, from the various political parties, and particularly those that took the key enabling actions. And finally, we are grateful to SolarReserve for their interest and determined application to break through with a solid technical and commercial business case to initiate this project in Port Augusta. We eagerly anticipate watching the Aurora project move through the remaining stages to realise construction, commissioning, and operation, and to see our community and state reap the economic and environmental benefits. If our group helped make it happen through our repeated presentation of fact-based, persistent and consistent advocacy, then we are truly proud.